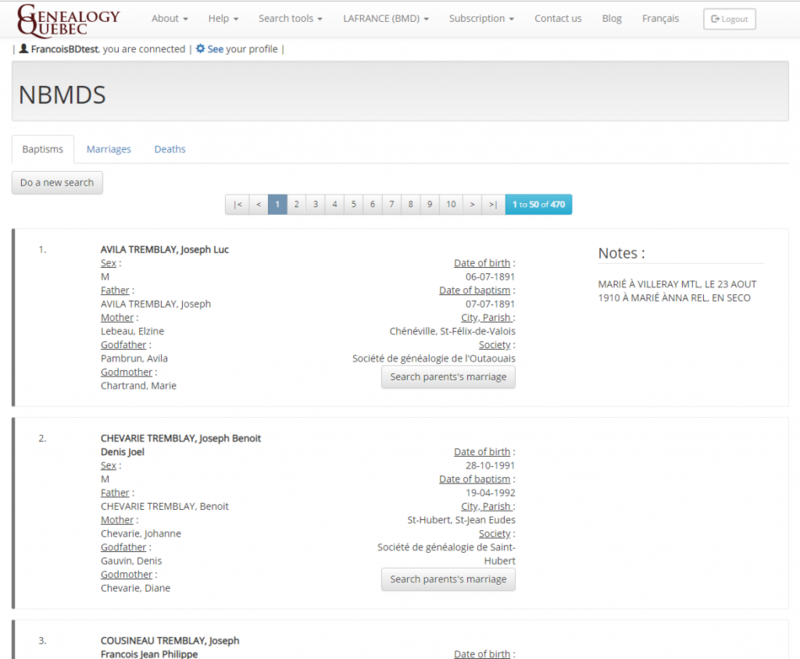 The NBMDS tool is one of 16 tools available to Genealogy Quebec subscribers. It is an index of Catholic and Protestant baptism, marriage and burial records, most of which are from the province of Quebec. The tool contains over 1.2 million records and is divided in 3 sections; baptisms, marriages, burials. The marriage section also contains some 120 000 marriage records from the United States and Ontario, dated from between the 17th century and the end of the 20th century. The NBMDS tool is equipped with a search engine specific to each type of record it contains, namely baptisms, marriages and burials. The search fields differ depending on the type of record searched, but the basic name, surname, date and location fields are always present. To begin your search, fill one or multiple search fields and press on “Search”, which will prompt a list of results. The records are presented as files which contain all of the relevant information extracted from the original record. Every record in the NBMDS tool is equipped with one or several automatic search buttons. These buttons allow you to automatically trigger searches for various records related to the one you are viewing. 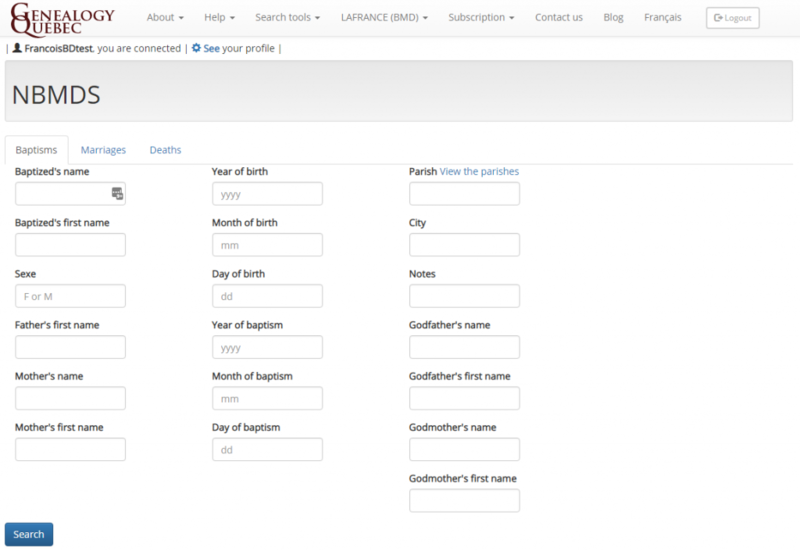 In the baptism section, the automatic search button allows you to search for the parents’ marriage record. In the marriage section, there are 6 different buttons per file. These buttons will trigger automatic searches for the parents, the baptism records or the burial records of the subjects. Finally, the burial section will let you automatically search for the subject’s own marriage, or that of their parents. Careful! If an automatic search does not yield any results, do not assume that the desired record does not exist in the NBMDS tool. For example, it is very possible that an individual’s name may be slightly different from one record to the next, or that the Priest committed a mistake when recording the original event. It is strongly recommended to do a manual search if the automatic search produces no results, and to try multiple combinations of first and last names if the initial searches are unsuccessful. The NBMDS tool allows searching for many variables, which makes it tempting to fill as many fields as possible when using the tool. However, we recommend that you keep your initial search as vague as possible, and clarify it as needed by adding one piece of information at a time. When the name or surname searched is rare or unusual, it is rarely necessary to add more information to the search. The more precise a search is, the more likely it is to omit the record you are looking for, as every single field must match. For example, an initial search could start with the surname and first name of the subject. If the number of results is too high, a variable such as the year of the event or the surname of another individual mentioned in the record can be added. Often, the simple fact of adding a third variable is enough to narrow the search down sufficiently. As with many of Genealogy Quebec’s tools, you may use the “%” character as a joker to search for a partial name. For example, a search for “Lar%” will include any name beginning in “Lar”, such as Larrivière, Larramée, Larue, etc. This allows you to keep your search more generic and is particularly useful for surnames that tend to have many different spellings. You may have noticed that the NBMDS does not provide a link to the original document from which its files have been created. 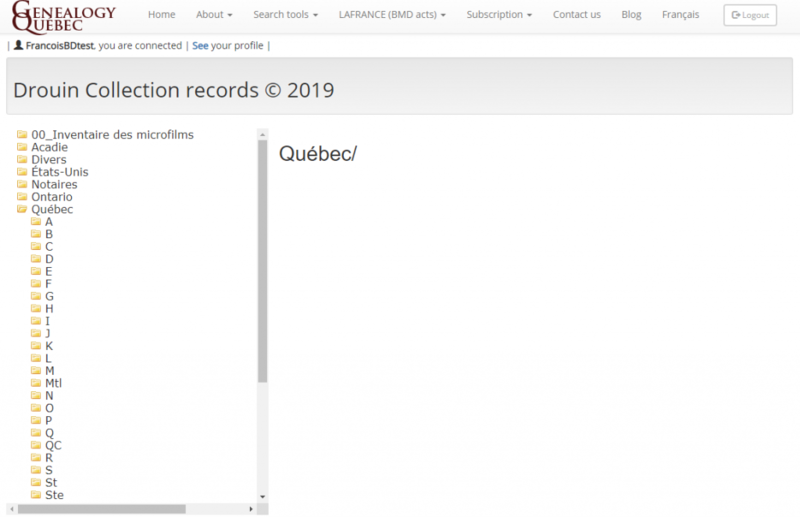 However, as a Genealogy Quebec subscriber, you have access to the entirety of Quebec’s Parish Registry up until 1940 through the Drouin Collection Records. You can find most of the original documents associated with the NBMDS records via the date and parish name or city name given in each record. We will use Adelaide Boucher’s baptism file as an example. The file tells us that Adelaide was baptized on the 14th of October in the St-Eustache parish. 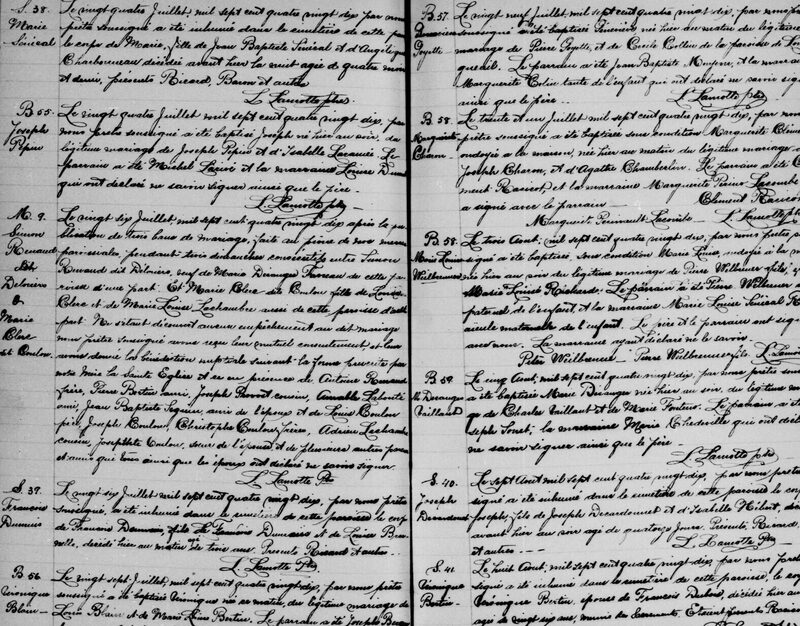 To find the original record, we will have to browse the St-Eustache parish register in the Drouin Collection Record. Once in the Drouin Collection Records, you will notice that the various registers are organized in a file tree structure. We will begin by opening the Quebec folder, as the baptism we are interested in was recorded in the province. Inside the Quebec folder, we have to find the right parish folder. Some parishes are listed under the name of the city they are located in, while others will be listed under the name of the parish itself. In the case of St-Eustache’s parishes, they are listed under the city’s name. 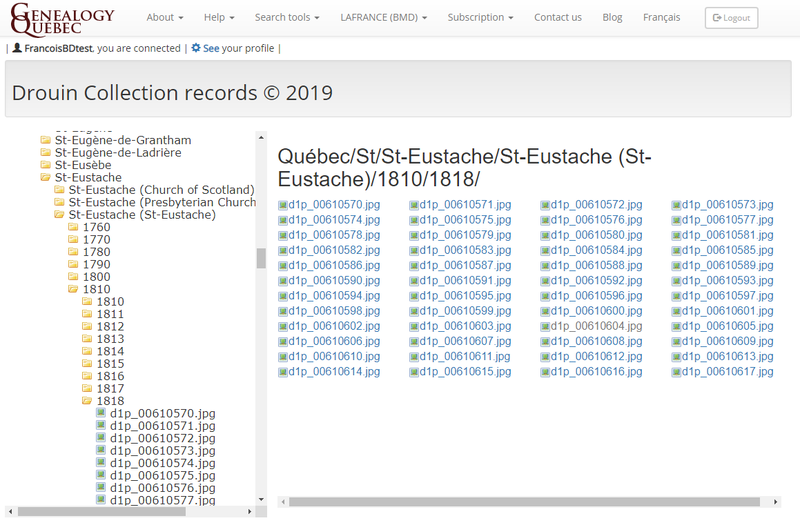 Browsing the St-Eustache folder in the Drouin Collection Records, we notice that it contains several sub-folders associated with different parishes. Since we have no way of knowing which parish would contain the baptism record, we will have to browse one folder at a time. Once inside the correct folder, we must navigate to the right year, which will give us access to all the images associated with that register for that specific year. It is important to know that in general, the images are listed in chronological order. This means that the first image in the folder will contain the first events recorded in that year, which are usually the ones from January. Similarly, the last few images in the folder will be those from the end of the year. Since Adélaide’s baptism was celebrated in October, it’s likely that her baptism will be found among the last few images. You may have to sift through a few pages before finding the right one, but by starting towards the end, you will save yourself some time. 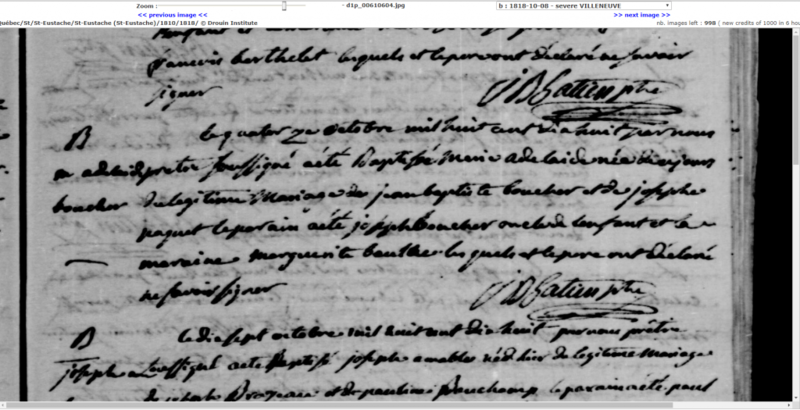 And with that, we were able to find the original document using the information given to us in an NBMDS file.